With the new Terrasport III, Mühle-Glashütte expands its successful line of sporty instrument watches to includea new medium-sized, 34-millimeter variant. In the style of classic aviator watches, this timepiece offers excellent readability and precision with an appealing retro charm. This new medium-sized variant of the Terrasport series is an unmistakable addition to this successful line of watches from Mühle-Glashütte. Alongside the characteristic Terrasport movement, this new watch also includes the Broad Arrow marker, a defining feature of classic aviator watches. This distinctive triangle at the 12 o’clock position helps pilots find their orientation even in rough turbulence. The Terrasport III’s clean, uncluttered dial design also provides an additional aid in ensuring the pilot’s correct orientation. Mühle’s signature restrained understatement is perfectly combined with tasteful design elements such as the red-tipped second hand and red marker at the 12 o’clock position. Clear, distinct numbers and filigree hands enable the wearer to accurately tell time at a glance. The movement has also been specially adapted for the new 34-millimeter case with the minute and hour indicators differing from the larger models in their width, but not their length. The Terrasport III dial also possesses Mühle’s typically clean design, enabling the watch to perfectly perform its duties as a linear time-keeping instrument. The Terrasport III is fitted with the tried and tested SW 200-1 Mühle movement, has a 38-hour power reserve and comes with characteristic Mühle refinements such as the patented woodpecker neck regulation and Mühle rotor. With its 34-millimeter diameter and a case of brushed stainless steel, the Terrasport III cuts a dashing figure even on more delicate wrists. 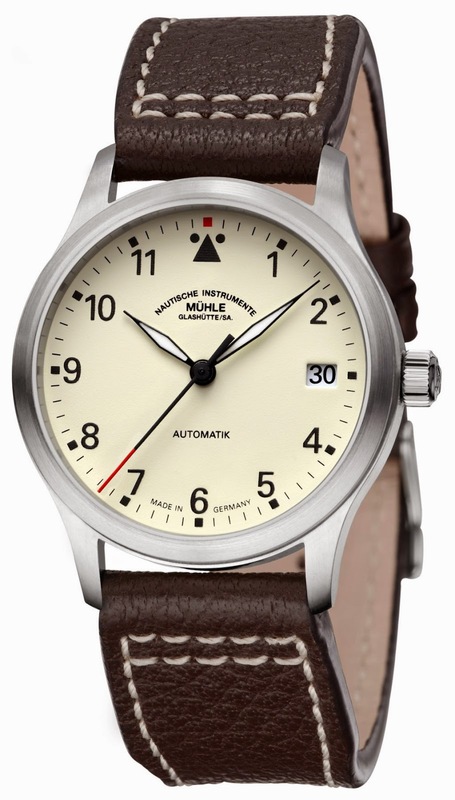 The comfortable, buffalo leather strap with white stitching is a perfect complement to the cream-colored dial. SW 220-1, automatic with woodpecker neck regulation, own rotor and characteristic surface finishes, fast date correction, stop second, 38-h power reserve.